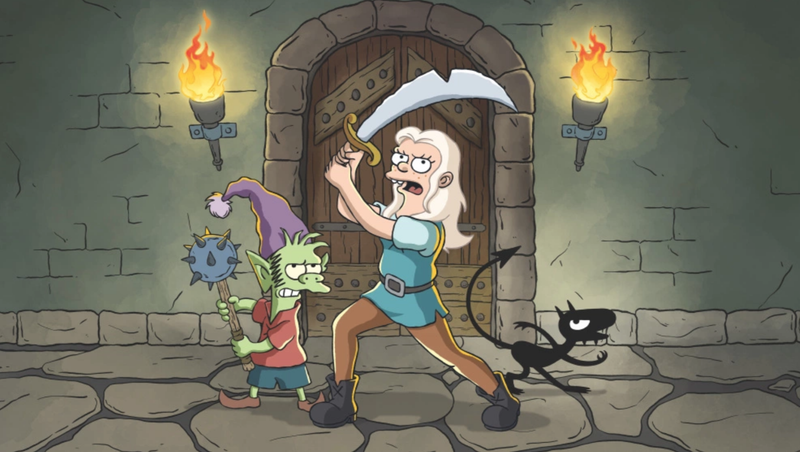 Netflix has set a premiere date and released the first images of Matt Groening’s upcoming animated series Disenchantment, his first new show in nearly two decades. Disenchantment is a fantasy series for adults that stars the voices of Abbi Jacobson (Broad City), Nat Faxon, and Eric André. According to Entertainment Weekly, the show is set in a shambolic medieval kingdom called Dreamland, and features a ragtag team characters: a princess named Bean who maybe has a drinking problem (Jacobson), a “plucky elf friend” (gotta have one of those, voiced by Faxon), and a personal demon (ditto, André) whose name is Luci. There will be additional voice appearances by: John DiMaggio, Billy West, Maurice LaMarche, Tress MacNeille, David Herman, Matt Berry, Jeny Batten, Rich Fulcher, Noel Fielding, and Lucy Montgomery. Groening is executive producing the venture along with Josh Weinstein.